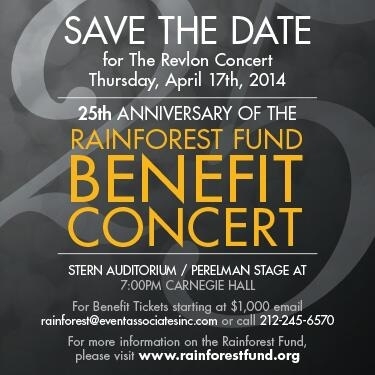 The actress Trudie Styler and her husband, the pop singer Sting, will be joined by more pop stars - Paul Simon, James Taylor, Dionne Warwick, Ivy Levan - as well as a trumpeter, Chris Botti, and an opera singer, Renée Fleming, in the biennial Revlon Rainforest Fund Benefit Concert at Carnegie Hall on April 17. The Rainforest Fund, which Sting and Ms. Styler founded in 1989, began as an organization meant to both campaign for environmental preservation and to help the indigenous people who live in the Amazon rainforest in Brazil. It has since expanded to include projects in 23 countries, including Belize, Cameroon, Costa Rica, El Salvador, Guatemala, Guyana, Honduras, Indonesia, Mexico, Peru and Venezuela. A spokeswoman for the organization said that the fund has raised $35 million. "This year is the Rainforest Fund’s 25th anniversary," Ms. Styler and Sting said in a statement, "and its work to protect rainforests around the globe for the people who live there and for all of us is more important than ever." 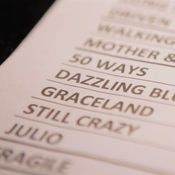 Exclusive Performances from the On Stage Together tour…check out the latest in Virtual Ticket! Sting.com Member Exclusive - Sting & Paul Simon's On Stage Together tour may have finished last weekend, but Sting.com continues to bring you exclusive content from the road. In this clip, Sting says that working with Paul has been “wonderful” and calls his body of work “incredibly inspiring.” Check out this preview and then login as a member for the full video featuring exclusive performances from Sting and Paul Simon together onstage plus a revealing interview with Sting.